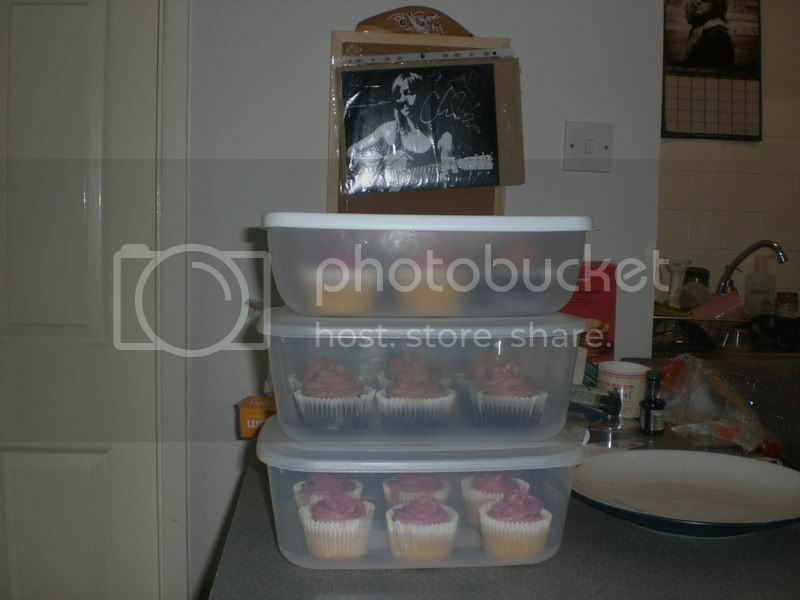 Alien on Toast: Come over to the darkside - we have cupcakes! Come over to the darkside - we have cupcakes! I worked from home this morning so I got to make myself a hot brekkie - pancakes! I'm so happy with these; not only were they awesome but they came out the pan in one piece - hurrah! 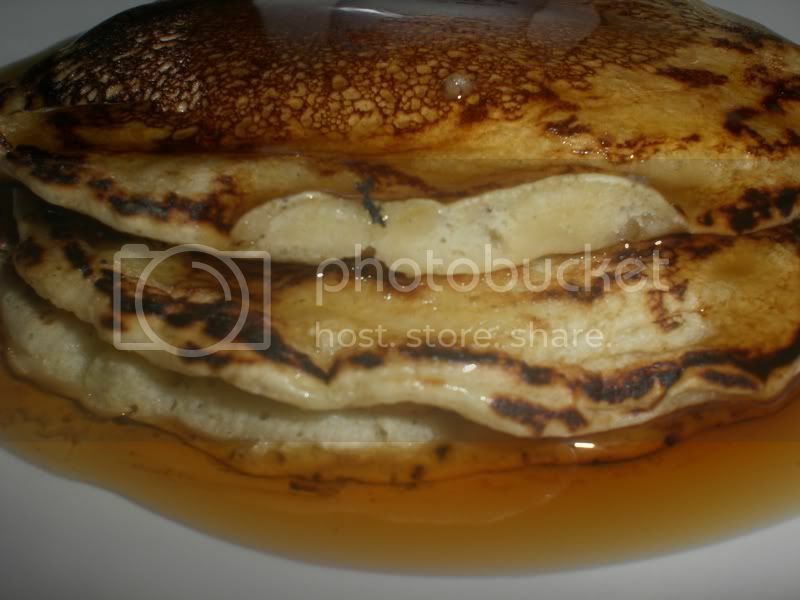 Here they are smothered in maple syrup! For dinner I did a mushroom and sun-dried tomato pilaff. To go with it I cut up some smoked tofu, gave it a gentle coating of flour and fried it in a little olive oil. I have discovered that I really love cutting the tofu up in these little triangles. My mum and dad are going to visit my grandad this weekend and as I'm not going I sent up a box of cupcake love - the best kind! Here they are straight out the oven. 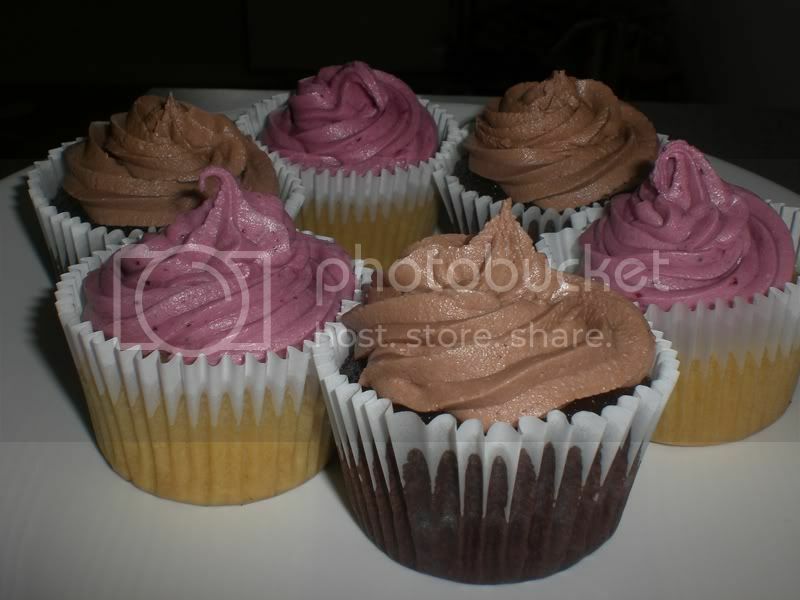 And frosted: chocolate orange cupcakes and vanilla cupcakes with blueberry frosting. Someone on the ppk asked for instructions on the blueberry frosting so I posted it but thought I'd add it in here in case anyone wants to have a go - it is perfect with the basic vanilla cupcakes (VCTOTW). Push the jam through a fine seive with the back of a spoon just to get out the lumps (there will still be some seeds in it but I think they look pretty). Add the shortening and mash together with a fork.Add the sugar in two goes, mashing with a fork in between. Add the vanilla and soymilk, mashing still. Then get the electric beaters in there and whip it till it's fluffy and you're done. awwwwwww! 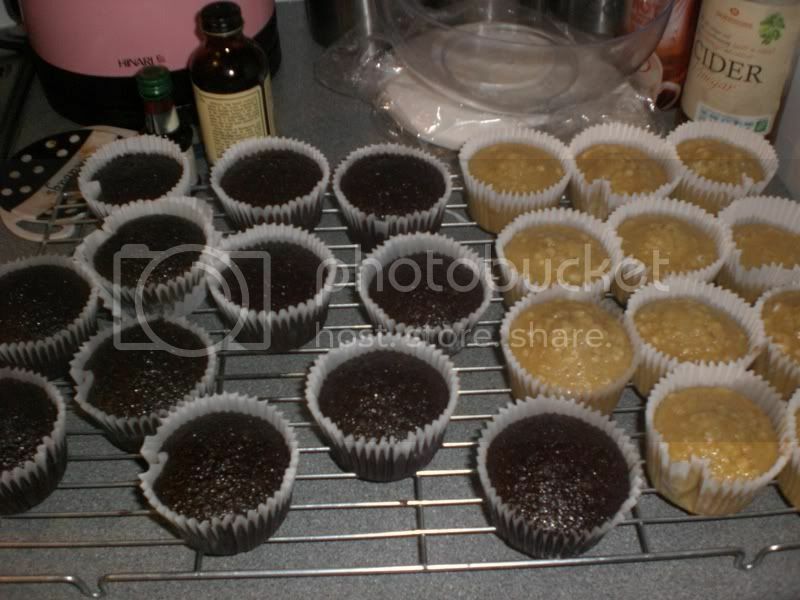 that's so nice & awesome of you to make cuppycakes for them to take & enjoy! they look amazing, too! 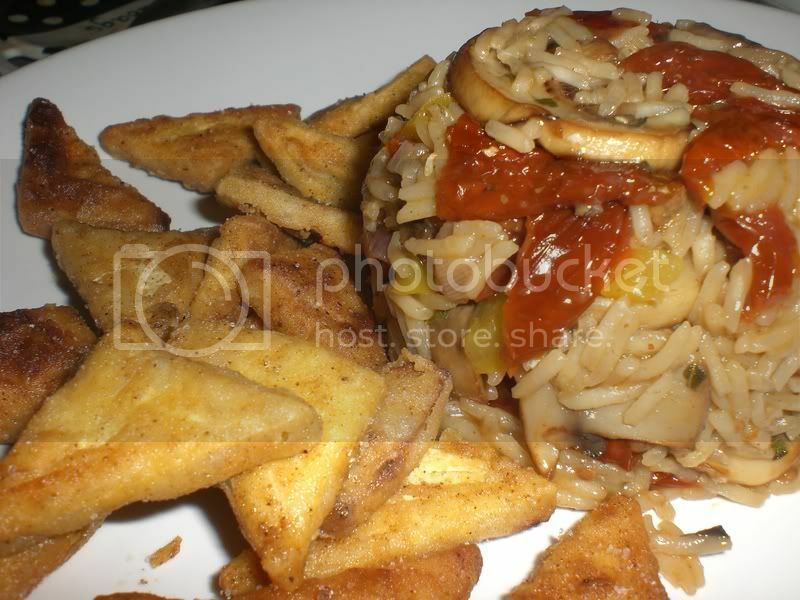 and so does your tofu & pilaf dish. that pilaf is making me huuuungry! and i'd love to eat those pancakes, too! man, they look glorious smothered in all that maple goodness! glad they came out of the pan easily - mine almost always stick and it's so frustrating! argh! Totally with you on the pancake thing - it's infuriating!! This is the first time they've ever not stuck! I bought a new pan not that long ago so it is still non-stick. It's really small (I think it's an omelette pan?) and I just sprayed it with a bit of oil and they slid out ok and even let me turn them!! I was so happy! I absolutely love how the frosting turned out on those! The colors & swirls are perfect. Thanks for the recipe too! and i also wanted to pop in and let you know that i nominated you for a fun webblog award - so stop by happyveganface to see all the fun details! :) i think your blog is glorious (and really super fun!) and you totally deserve the award! yay! You've convinced me to come to the dark side! And your blog is full of beautiful pictures and delicious food!! You like me, you really like me...! I <3 free stuff. And tofu. Mandolins - Tools of the Devil!